New CC member Eric Cacciatore wanted to share his story with our community — and invite you to take on a challenge. Read on. First and foremost, I am a student majoring in hospitality management. 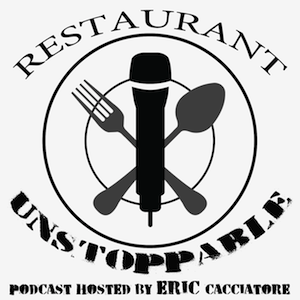 Secondly, I am the founder and host of Restaurant Unstoppable, a podcast dedicated to learning from and collaborating with successful restaurant professionals across the nation. Over the past few months I have interviewed some incredible guests who have taught me about the type of leadership, character, and passion that is required to be successful in the restaurant industry. A common denominator shared by all of these guests has been their support of Chefs Collaborative. The power and effectiveness of collaboration to create awareness. The vitality of supporting your community’s economy by sourcing from local purveyors, farmers, and artisans. We need to regrow our middle class. Sustainability is not just about sustaining our food supply; it is also about sustaining our culture, tradition, and the sense of community and hospitality. Wait—did he just say sustainability ties into hospitality? That’s a stretch. No, really, it’s not. In fact, Chefs Collaborative Board Member Evan Mallet points out in my very first episode that the concept of serving food to strangers first began in inns and hotels. These inns and hotels would serve soup as restorantes (translated in French as “restoratives”) to help tired travelers complete their journey. This is the origin of restaurant, a direct by-product of the hospitality industry. See? *Sniff* [thumb brushes nose]. Now that I’ve made my case, let’s look more closely at hospitality. Danny Meyers in Setting the Table defines “enlightened hospitality” (what he believes is the key to his success) as “prioritizing the order in which you deploy hospitality, starting first with your employees, followed by your guest, community, suppliers and investors.” Notice the emphasis on community and supplies? I believe the key to success in this industry (alongside know-how and sincere passion) is being a genuinely good person. Hospitality is at the core of all good people. Hospitality is warmth, caring, friendliness, and neighborliness, accompanied by generosity, helpfulness, geniality, and kindness. I encourage you to put these words to use the next time you engage your community and local suppliers, and in doing so you will grow happier and more successful. I also believe that with the establishment of chains, corporations, and franchising, this quality of hospitality has fast faded from the food and beverage industry in addition to sustainable practices. Chefs Collaborative resonated so deeply with me since discovering it that I decided to support the cause by becoming a member. It is because of Chefs Collaborative and other influences that I’ve decided to focus my podcast on the indie restaurant professionals. They are the true artisans and skilled craftsmen of our industry, and the ones we can learn the most from. I may not have any monetary value to offer our Collaborative, but I do have a voice and a top ranked restaurant podcast on iTunes that can act as a vehicle to spread our message on sustainability. I am looking to other Collaborative members for support. Like I mentioned earlier, I lack an abundance of connections. I am a student of hospitality who decided to create a podcast to help others by keenly listening to the advice of successful restaurant professionals. Please help me connect with recognized, well-respected, and influential chefs, general managers, proprietors, and restaurateurs. Collaborative members can use this as an opportunity to create awareness and promote our cause. To conclude, I’ll leave you with a challenge: pick one restaurant professional you admire and would love to learn from. Tweet your answers to @EricCacciatore or email me at eric@restaurantunstoppable.com.